Dog Dressing and Sumo Wrestling | Will My Dog Hate Me? 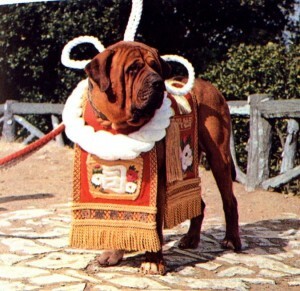 I promised more Japanese dog dressing and you don’t get outfits more elaborate than those worn by Tosa Inu. The breed, which originated in the Tosa district on the Island of Shikoku, was created in the second half of the 19th century, when medium-sized Japanese hunting dogs were mixed with mastiffs, Great Danes and bull terriers, among other Western breeds. The result: A big, muscular fighter. Or should I say wrestler. Tosa Inu fights, which still take place in Japan, are a far cry from pit bull battles. For one thing, they’re legal. For another, no blood, teeth, or even growling are involved; the fight ends as soon as any aggressiveness is displayed. Just like the sumo wrestlers to whom they’re often compared, the dogs work to overbalance each other and pin each other to the ground. For more detail, see the Bulldog Information link on Dog Breeders of the World, which is also the source of the picture. The dogs wrestle naked (similar to sumos) but the winners wear really swell ceremonial clothes. 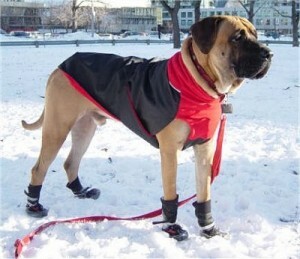 Here’s a Tosa Inu just relaxing in a sporty outfit, ready to play in the snow. I have read that these dogs are lead into the ring by TWO handlers, & seen a few pics that suggest it’s true: A second handler might just be the ultimate fashion accessory. Wow, now that’s impressive. I don’t think even the human sumos get dual escorts. And the dog outfits are much more elaborate. Pingback: Dogs in International Costumes: Bone Voyage!